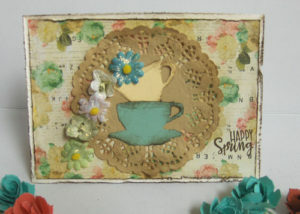 Time for the Spring Blog Hop at “Coffee Loving Cardmakers”! I love doing these seasonal hops with one of my most favorite things . . . COFFEE!! Soo many cute coffee stamps and dies and papers out there in the papercrafty world now . . .and sooo much fun! Check out all the cool cards being posted here! Last time there were more than 600 submissions!!! Appears there are MANY of us who are coffee fans! Why not take a few minutes and make a “coffee card” yourself? I’ll have another card to post tomorrow! Here’s what I used on this card: Prima paper pad “Coffee Break”; Sizzex “cup” dies; multiple flower sources; greeting – Verve Stamps “Coffee Helps”. Love the backing PP. so pretty card! Super fun card, love that Prima paper. Sweet card, I am a big fan of that prima paper. Simply gorgeous! Love the vintage vibe. I love the vintage look of this card. So beautiful. I love your blog JRR! This is a gorgeous card!